I don’t think I could live without pasta! How about you? I’m always trying to find new ways to enjoy it. So I hit my local farmers’ market and filled up my sack with all of the fresh vegetables that “called out” to me, including some amazing beets. (I seem to be on a beet kick lately!) Then straight to my kitchen I went. Actually, I take that back. Straight to my building rooftop I went where I snipped a day’s worth of fresh basil. (Yep, that’s how we do it here in Brooklyn!) Then off to my kitchen I went. This is what I got when I married pasta with the classic tastes of a beet and goat cheese salad. 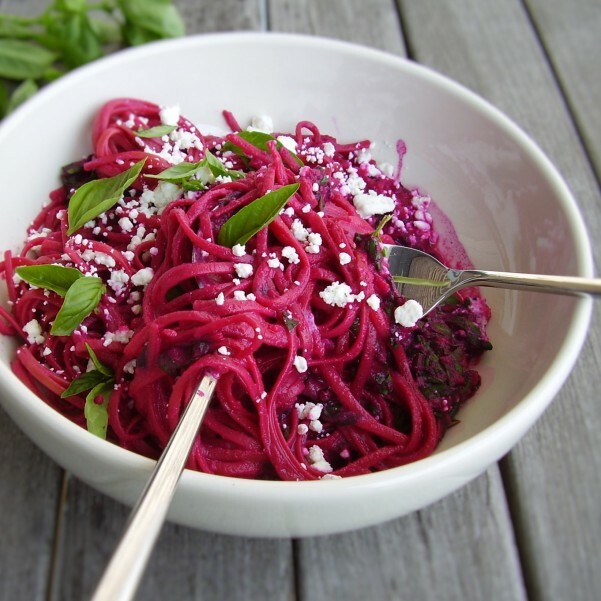 It’s a family-sized pasta dish that’s stunning to look at (hello, fuchsia!) and absolutely scrumptious. It’s a colorful way to bring the family back to the table … if there’s no objection to pink food! It’s hard not to love a good bowl of pasta, after all. Though since this pasta is particularly pretty, you may find it best suited to an evening in with girlfriends. Either way, this luxurious linguine is a must try—especially when you’re able to find organic or local beets at your farmers market. Hope you enjoy it as much as I do … stained pink fingers and all! Why it’s better for you? It’s a celebration of whole grains and seasonal vegetables—plus it’s packed with fiber! Preheat the oven (or toaster oven) to 350°F. Wash, dry, and remove the leaves from the beets; thinly slice the leaves and chill until ready to use. Wrap the beets in recycled aluminum foil and roast in the oven until cooked through and tender, about 1 hour 15 minutes. When cool enough to handle, scrape off the beet skin using the dull side of a paring knife. Then chop the beets. 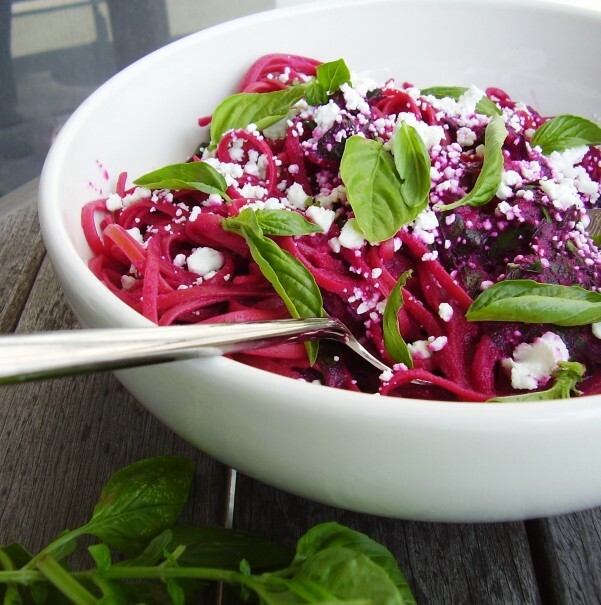 While the pasta is cooking, pour the beet puree into a large sauté pan and bring just to a boil over high heat. Reduce heat to medium-low, add the beet greens, and cook while stirring until the greens are wilted, about 5 minutes. Drain the pasta, reserving 1/2 cup of the cooking liquid. Add the pasta to the beet sauce and gently toss with tongs to combine. Add desired amount of reserved cooking liquid (if any) and gently toss to combine. *Each beet weighed 6 1/2 ounces without leaves before roasting. After roasting and peeling, the total weight of the beets was 10 3/4 ounces. The amount of sliced beet leaves I used was 2 cups packed. The RecipeRedux theme this month is “Back to the Dinner Table.” Making this recipe is one way to help you get back to regular family mealtime as fall is around the corner! I’ve got some beets in the fridge and I’d love to have a go at this. I’ve never tried them with pasta before but it just looks so colourful and inviting! This dish looks amazing! I definitely love pasta so this dish is right up my alley 🙂 Beets and goat cheese are a winning combo, and totally worth the red fingers! What a beautiful dish! 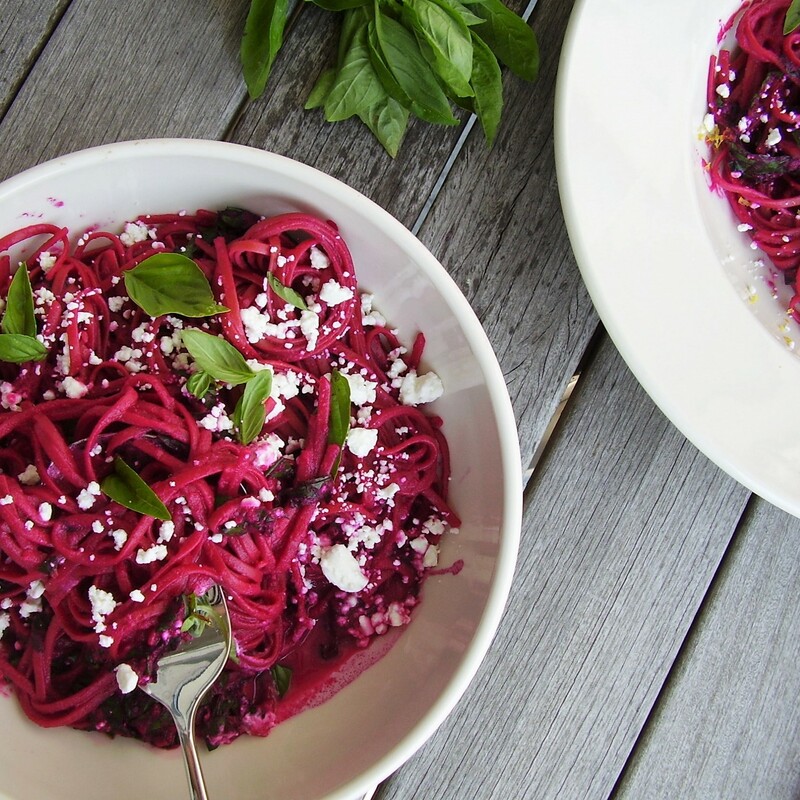 Beets and goat cheese is a match made in heaven in my book and can’t wait to try it together in this pasta dish!